The second international snow sculpting contest BALTIC SNOW CALL gathered 10 teams from across the world to Nallikari 20.-24.2.2019. Sculptors representing many different styles hailed from Sweden, Norway, Ireland, Germany, The Netherlands, Lithuania, USA, and Mexico. Last year’s medallists Russia, Finland, and Estonia were automatically invited. The four-day contest had a wide range of weather conditions but ultimately team Mexico was crowned champion. The 2018 medalists Russia, Finland, and Estonia were invited automatically. Among dozens of applications, the rest of the teams were chosen for the contest. The teams has arrived from Sweden, Norway, Germany, The Netherlands, Lithuania, USA and Mexico. All of the teams are renowned sculptors who have competed in snow sculpting events around the world. The teams feature new prodigies as well as veteran sculptors. The sculpture park Snow Art Park will be a true culture cocktail. The teams represent different nationalities but also different styles and character. The contestant teams for the second Baltic Snow Call have now been chosen. Baltic Snow Call started as an invitational contest for sculptors around Baltic Sea region. This time we decided to spread the call to the whole universe! The qualification process has been a very difficult task, because of the many excellent applications we have received from all around the globe. From some of the countries we have got two or even more applications. We received applications from almost all continents. For example teams from Egypt, Korea, Argentina, Iran and India were all very keen to participate in Baltic Snow Call 2019. – A big thanks to all applicants! We will be in touch with all registered teams and will publish the participants in early December. Our huge thanks to all of you for your interest in our event! We got tens of great applications and the selection process will be horrible. BSC organisation invites ten teams from all over the world. We have invited the last years medalists from Russia, Finland and Estonia. Rest of the seven participants are chosen from the applications we got in application period between 6th – 30th of November. What's going on here – BSC sneak peak! The open application period is currently running for Baltic Snow Call 2019 -event and it’s time for a little progress report. This is also a reminder for you Dear snow sculptors around the world: We are waiting for your applications until 30th of November. The participating teams will be chosen in early December. We've now published our 1st media release and our partner Business Oulu has also shared an info of the event. The top three teams from last winter are automatically invited to the contest. Here's BSC 2018 winner Team Russia: Svetlana Tutanova, Aleksei Moskalev & Mikhail Erushev. Photo Petteri Heikkinen. Throwback Sunday – BSC 2018 AFTERMOVIE RELEASED! If you have felt like there's no life after Baltic Snow Call 2018 at least we have a movie for you. It's been a while when those snow babies were made: the sculptures have gone back from solid to liquid, and wheels are rolling for the next event. But now, while waiting winter to come again, it's time for a little throwback. During the first annual Baltic Snow Call you couldn't really avoid BSC media team and their cameras: They documented the whole event from every angle of view. Let's see what happened! Scandinavian Outdoor Award: The BEST event in Scandinavia! Dazzling international event brings together art, craftsmanship and the festival! Scandinavian Outdoor Group awarded the international snow sculpting contest BALTIC SNOW CALL as THE BEST EVENT IN SCANDINAVIA in Berlin 7.3.2018! SNOW CALL melted the hearts of people! The brand new winter event – four day international snow sculpting contest Baltic Snow Call – was held in Nallikari Oulu, Finland on 21-25 February 2018. The participants were the top names of international snow artists, most representing the Baltic Sea region. Total of ten teams participated in the contest starting with 3x3x3 meter snow cubes. Illuminated Snow Call Winter Art Park. Photo Visit Oulu, Harri Tarvainen. Baltic Snow Call in Glopas – Hear snow artist stories about their work! Get this free app and listen what snow artists of BSC told about their sculptures! You can do it while walking here at the Winter Art Park sculpture area or if it's not possible just there where you are, comfortably on the couch. Every team has told a small story behind their art work and it's recorded. How to get an app – read the rest of this post. Also Team Sweden told about their impressive work "Nonnative". TOP 3 of the First BALTIC SNOW CALL contest! The first Baltic Snow Call – International Snow Sculpting Contest in Nallikari Oulu Finland is succesfully behind and we got the winners! Our Jury was working in Nallikari since Friday and they saw ready sculptures in color lights on Saturday night and also in the daylight Sunday morning. Who is the TOP 3 they have been chosen, check it out here. TEAM RUSSIA: Svetlana Tutanova, Aleksei Moskalev, Mikhail Erushev won the very first Baltic Snow Call contest! Photo by Elisey Kuziakin. Baltic Snow Call 2018 High-class Jury! Today is the Awards Ceremony day of the first annual Baltic Snow Call! Our Jury has been working here in Nallikari Oulu Finland since Friday. 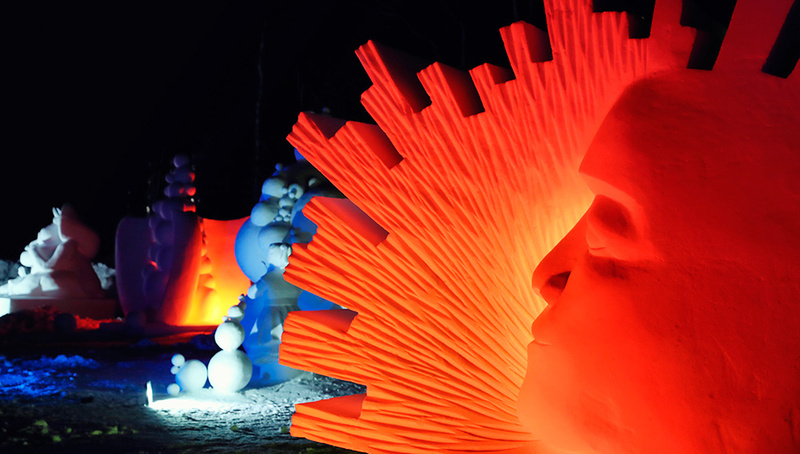 Last night they saw lightened sculptures in the night when our sculpture area turned to an amazing Winter Art Park in cooperaton with LUMO Light Festival Oulu. This morning they continued working also to see sculptures in daylight. In the following we are introducing our Baltic Snow Call Jury 2018 lead by Juhani Lillberg from AISNG. Lillberg also acts as a patron of Baltic Snow Call. BSC 2018 Jury: Antti Tenetz, Juhani Lillberg, Nina Heikkonen, Ricky Sandberg. 5th member of the jury Matti Vaskimo is missing from the picture! Photo Sami Hänninen. Master of the Contest & Everything – Janne Andberg! Baltic Snow Call proudly presents BSC Team arbitrary order: Finally it's his time!!! Janne, he is just f****n' Master of everything. Innovate, powerful person head full of ideas. Maybe he has also a somekind of diagnose for creative things. He is also a snow sculptor – maybe one of the best known in Finland. He knows everybody in that business, has skills for snow sculpting and just a bit crazy as well. Ms. Design Anna Koivukangas – PEACE, LOVE & SNOW SCULPTING! TEAM BEHIND THE SCENE – We will proudly present BSC Organisators arbitrary order. Lovely Anna – she’s like a film star (although she likes much more to be behind the camera)! She is our master of Design, Queen of marketing materials and an artist. Besides all that she is a mum of a teenage boy, secretary of Ikitalvi Union, a snow sculptor and part of the very fabulous Tuulispäät Snow Sculpting Team. And she won also FINNISH CHAMPIONSHIP this year with her team. What a lady!